River Rolny Architects were faced with the challenge of creating a budget home for a young and independent inhabitant on a plot with limited dimensions. As you will see if you follow our tour of the property, the results were nothing short of perfect. 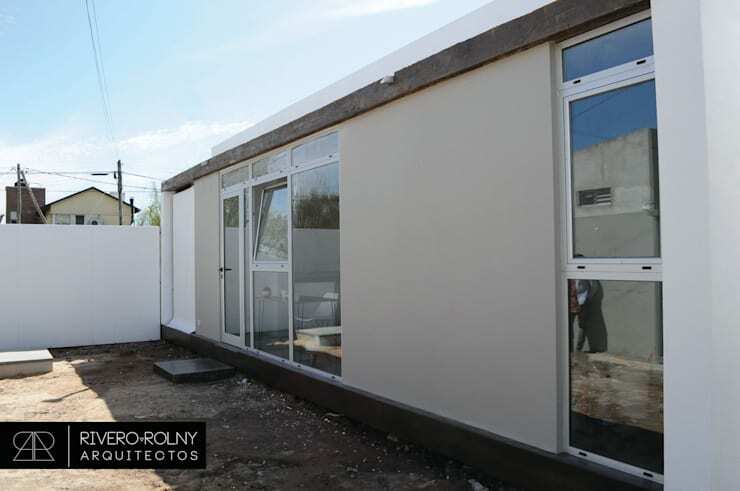 The house provides in all the needs of a single person starting out, whilst being extremely cost-effective and economic with space. In addition to this, the product looks very modern and is not at all aesthetically unpleasing. It’s not easy to build your first home, in fact, it’s quite impressive. This project may be of use to you if this is something to which you aspire. The house was not built with an exaggerated budget, yet it is super comfortable and functional. Don’t believe you can get all of this building your very first home? Well, join us for a tour and decide for yourself! Here we have a view of the part of the house that opens up onto the back yard of the property. As we have already said, the architects had a restricted place to work with, an enclosed 200 square meters for the entire property. Subsequently, the house itself is a mere 60 square meters of area. 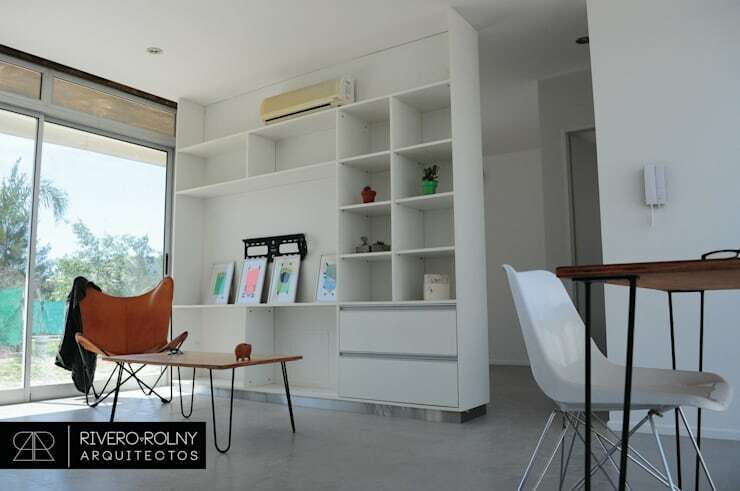 This is, however, still luxurious for your very first home, and if you think it will be difficult to make something of a 60 sqm house, just take a look whatcan be done with a 32 sqm apartment! The garden space is not very attractive right now, but we can certainly see that it has much potential. The owner can either plant a lawn with some lovely blooming flowers, ensuring that perfect backyard garden for relaxation and recreation, or opt for a spectacular and useful vegetable garden! The house’s shape is rectangular, much like the containerhomes that’s so popular lately. The material used in construction consists primarily of concrete, with the addition of wooden elements for a more eclectic look. 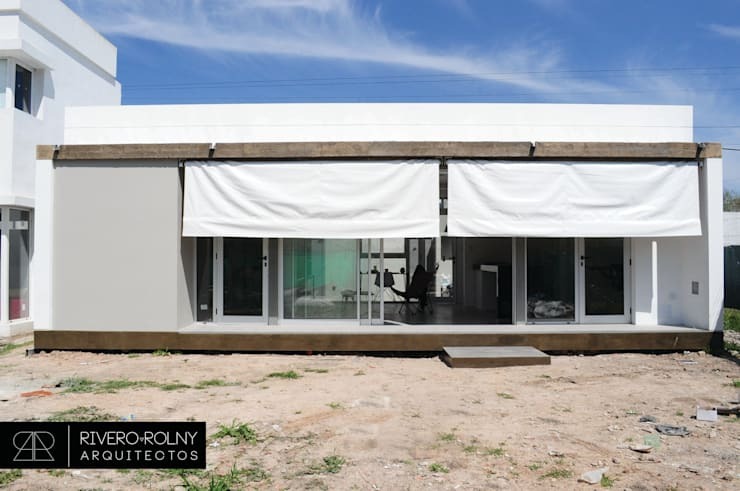 The patio has a system of awnings installed, which not only provides the opportunity for privacy on the patio of the house, but also shelters it the space from harsh sun or weather when necessary. The house had been designed in a manner which the private and service areas of the home are situated on the sides of the building, freeing up the central area to act as social or public space. This is also why we such large glass panes in the centre, since it opens up the public space indoors to the outdoor world. This also enlarges the living space, ensuring that much natural light enters the home and that the perceived boundaries of the area are expanded. 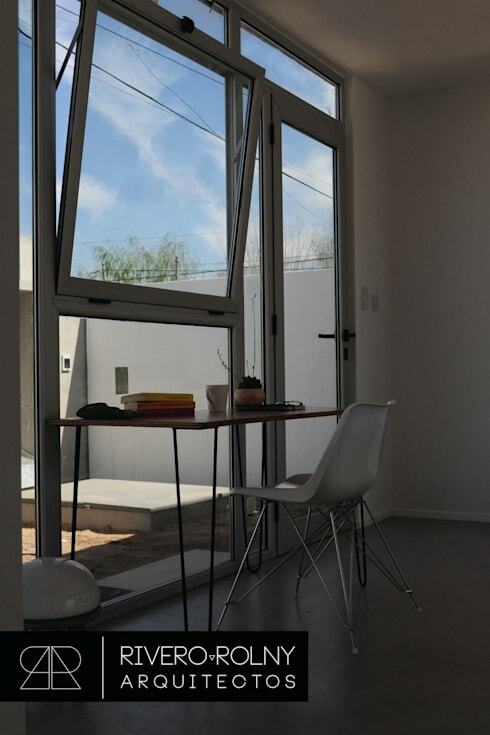 Here we can also see the use of aluminium frames for the glass panes, windows and doors. This ensures sturdy panes which are much more weather-resistant than wooden frames or those of other materials. According to Rivero Rolny Architects, who had been the project managers of this endeavour, the house had been designed with two patios – one at the back we saw in the previous image and which is of more limited dimensions, as well as another on the other side which occupies half of the area of the lot. The latter area’s sole purpose is for recreation. Now we enter the home. This is the public living area we had spoken about before. The first feature worth mentioning is the white ceiling and walls. Minimalism definitely dictates the style of this space, and the white background ensures that thinks are kept simple and streamlined. The flooring in this area consists of large ceramic tiles in a very light grey colour. The surface of these tiles are also very smooth, ensuring that the surface is streamlined to suit the general style of the room. The ridges of the separate tiles are almost indistinguishable, making the coated surface seem like a continued element of the home. The furniture is similarly simplistic, with skinny legs on the furniture and minimal ornamentation. It almost looks like a camp site or set, but with class. The modular library unit to the back, which also acts as a divider between spaces, creates a sense of organisation in the space, whilst also allowing the opportunity to exhibit decorative elements. Now we move on the kitchen, which is just at the back of our vantage point in the previous image. Right now it is a fairly empty space, such as the garden, but we can definitely envision it being the warm heart of the house. The space has minimal furnishings, allowing for the addition of a large refrigerator and some kitchen cupboard. 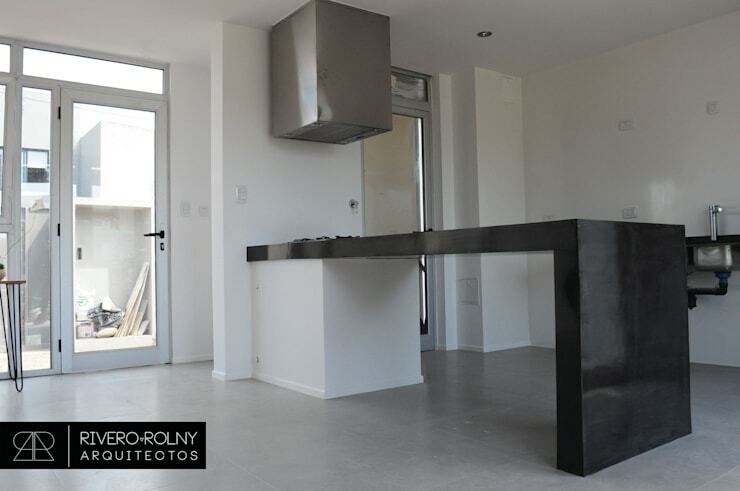 The main kitchen counter is of black laminate, adding a sense of sophistication to the space. Appliances are in stainless steel, giving that industrial kitchen look, almost like a haute cuisine restaurant or hotel kitchen. With the addition of the mission furniture mentioned, as well as some bar stools this side of the kitchen counter, this can be the perfect breakfast nook and kitchen combo! We end off our tour of this impressive little house with the study corner or the home. It is utterly simple: a stylish and minimal desk, accompanied by a Scandinavian style chair. The desk is pushed up to the glass-panelled area of the wall, making it the perfect spot for as much natural light as possible. It is also a great way to stimulate productivity – a view of nature while working is sure to bring inspiration as well as relaxation, especially as opposed to a fluorescent-lit office without ventilation! Do you think this is a good first home for a young, single person? What do you like most about it? We'd love to hear your thoughts!